In order to check whether the tide gauge is working or not, a tidal observation needs to take place. Over the course of several hours, the tide is measured as it rises or falls on graduated staffs and is recorded and compared to our tidal gauge data. Credit Brian Glunz for the photo. While horizontal control base stations are used to improve the accuracy of the positions of all points on a surface by providing a fixed known location to compare to GPS coordinates, constantly changing tides present another challenge in of its own. 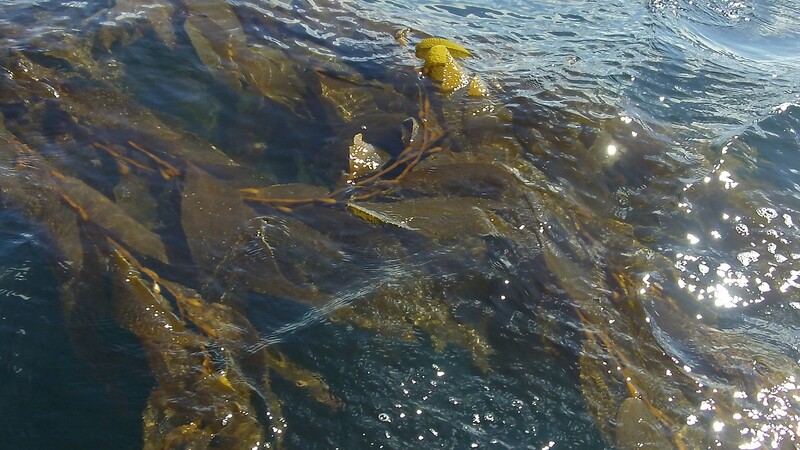 With tides in the survey area ranging 3 to 6 meters (10 to 20 ft.), depths can vary widely for various shallow-water hazards depending on the strength of the tide. 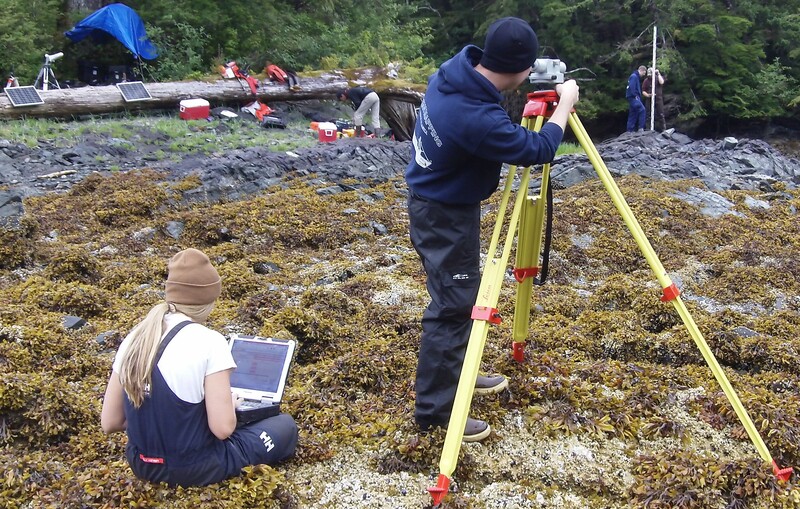 Consequently, accurate tide data must be recorded during the survey and in close proximity of the survey site since tides vary widely depending on topography, weather systems, and other factors. This is where tide stations come into play and are necessary to accurately gauge the vertical level of water throughout the survey area. Surveying equipment is used to check benchmarks near the tide station in the upper left for any movement. Hydrographic Assistant Survey Technician Hannah Marshburn is recording data from the leveling process with Ensign Matthew Sharr sighting a staff held in place by Ensign Mason Carroll and Hydrographic Senior Survey Technician Clint Marcus. Before a survey is started in an area, a tide station can be set up within the survey area to measure local tides. The tide stations use solar cells to generate electricity to power a small compressor on land that sends air through a hose that is attached to the ocean bottom in a near-shore environment. 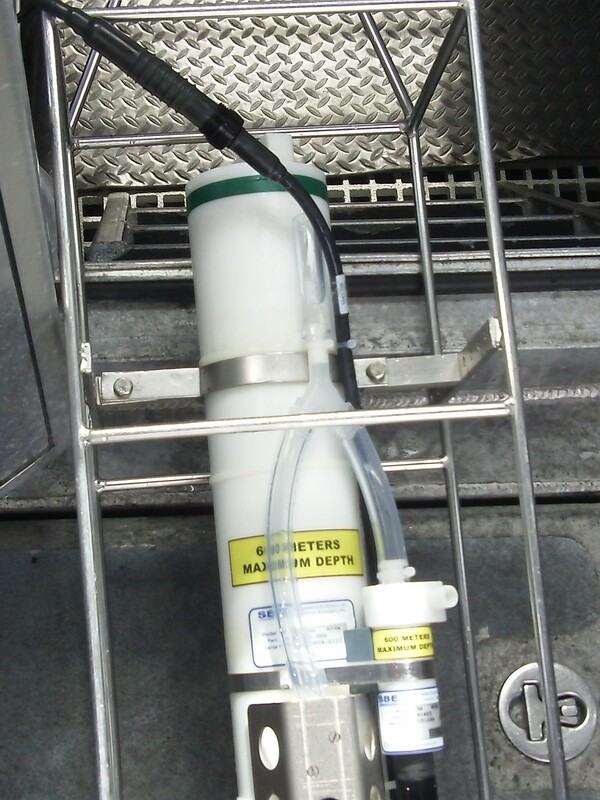 The tide gauge can measure how much pressure is needed to generate a bubble out the end of the hose, the greater the pressure, the deeper the water. These pressure gradients correlate to a certain depth of water while the depth of the water is tied to a nearby benchmark of surveyed elevation. This information is then transmitted out to tide reporting sites online. For additional data on tide patterns, the information on tide levels can be downloaded from the gauge in refining survey data. In order to ensure that a tide gauge is working correctly, manual tide observations are periodically made at the same location. Additionally, the benchmarks near the tide gauge go through a process called “leveling.” This is survey work that compares all of the secondary benchmarks in the area to the primary benchmark. If none of the benchmarks have moved relative to each other, it is safer to assume that the benchmarks still represent the elevation that they were originally surveyed. Once the survey in the area is completed, the tidal gauge is packed up to be used at another location. Since the portion of the tidal gauge that releases the pressurized bubble is under the entire tidal water column, a dive team is required to remove the remaining equipment. The entire tidal gauge site is returned to how it looked before the station was set up. Only the survey benchmarks remain for future use. From left to right Ensign Tyler Fifield charts our course while Able Seaman Godfrey Gittens has the helm with Ensign Lander Van Hoef controlling the power to propulsion. Bridge usually has at least one officer and one deck member on watch at all times. 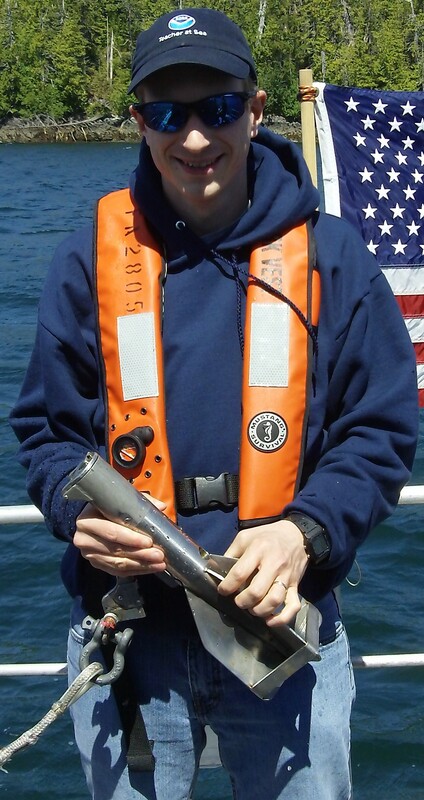 Ensign Fifield has been in NOAA and on the Fairweather for two years and has a background in marine safety and environmental protection. AB Gittens spent 4 years in the Navy, 20 years on commercial and military marine contracted vessels, and has now worked for NOAA for a couple of months. Ensign Van Hoef has a background in mathematics and has been on the Fairweather for six months. The Fairweather also has officers, the NOAA Corps, to help run the ship and carry out NOAA’s mission by utilizing NOAA’s fleet of ships and aircraft and by staffing key land-based positions throughout the organization. The NOAA Corps ensures that trained personnel are always available to carry out NOAA’s missions using cutting-edge science and technology. This gives NOAA the flexibility it needs to complete many types of varied research since officers are trained to fulfill many types of missions. This gives NOAA the ability to respond quickly to scientific and technological needs and helps retain a continuity of operations and protocol throughout the vast fleet and area of operations. In order to be considered for acceptance into the NOAA Corp, applicants must have at least a four year degree in a field of study relating to NOAA’s scientific and technological interests. Once accepted into the program, they go through five months of training at the United States Coast Guard Academy where they develop an understanding of NOAA’s mission, maritime and nautical skills, and general ship and boat operation skills. 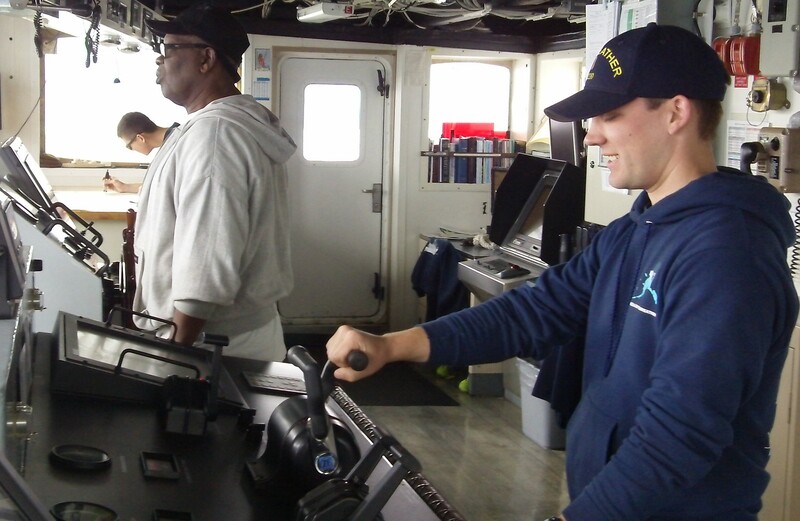 After successful completion of the training, NOAA officers are placed on a ship in the fleet for three years of sea duty to begin their new career. 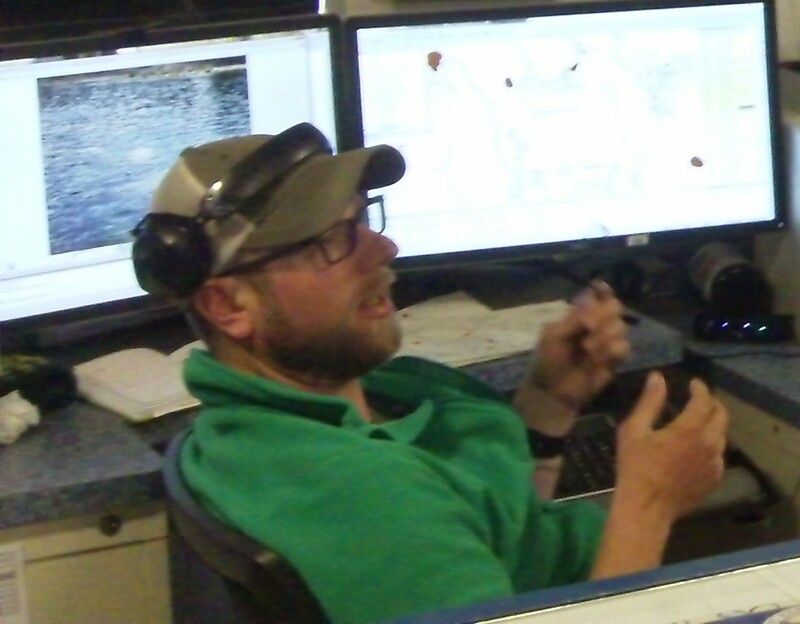 Chief Electronics Technician Sean Donovan performs his daily check of communications systems on the bridge. CET Donovan served as a naval service ground electronic technician for 11 years in the Navy and has been in NOAA for 8 months. On the Fairweather NOAA Corp officers help run and manage the ship and launch boats. They navigate the ship and stand watch on the bridge. They work with the other departments to ensure that the mission is accomplished and everyone remains safe during the mission. 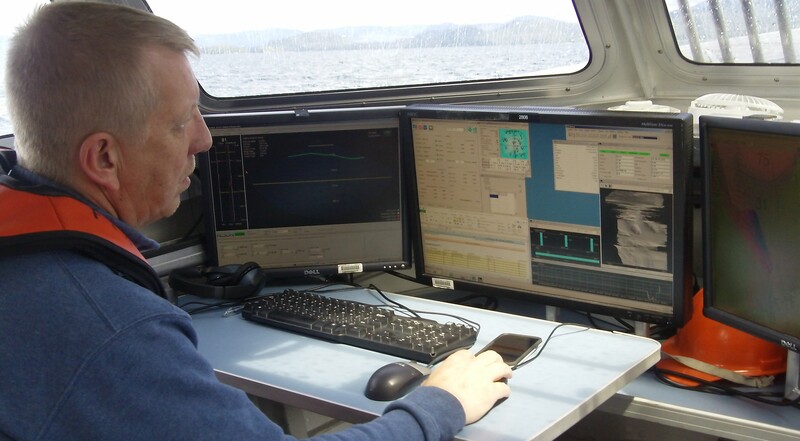 On a hydrographic survey ship such as the Fairweather, Corps officers commonly have the position of sheet manager for hydrographic survey regions as collateral duties allowing them the opportunity to plan the logistics of hydrographic survey areas and learn how to use software associated with hydrographic data collection and analysis. Additionally, officers will be assigned to other scientific missions as they arise since the Fairweather will participate in a variety of scientific projects throughout the year. A hydrographic ship such as the Fairweather requires many departments to work together including the NOAA Corps officers to accomplish the mission. There is the deck department and engineering department and the steward department as I have discussed their role in previous posts. However, there are also electronic technicians that assist the survey in all of its technological aspects including the ship’s servers, electronics, radar, and communication systems. Since technology plays a critical role in the collection and analysis of data, a hydrographic ship depends on these systems to carry out its scientific research. Acting Chief Hydrographic Survey Technician John Doroba prepares a boat launch for another portion of the hydrographic survey. ACHST Doroba is the lead survey technician for this leg. He has a background in geography, physical science, and information systems with a decade of work experience in and out of NOAA relating to surveying and related technology. 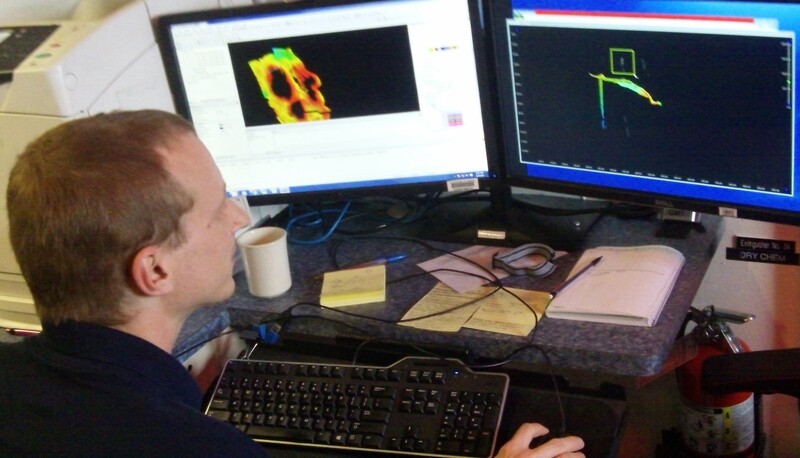 The survey department does the bulk of the collection and analysis of hydrographic data. Depending on experience and education background, someone in survey may start out as a junior survey technician or assistant survey technician and advance up to a survey technician, senior survey technician, and possibly a chief survey technician. With each step more years of experience is required because a greater amount of responsibility comes with each position concerning that survey. 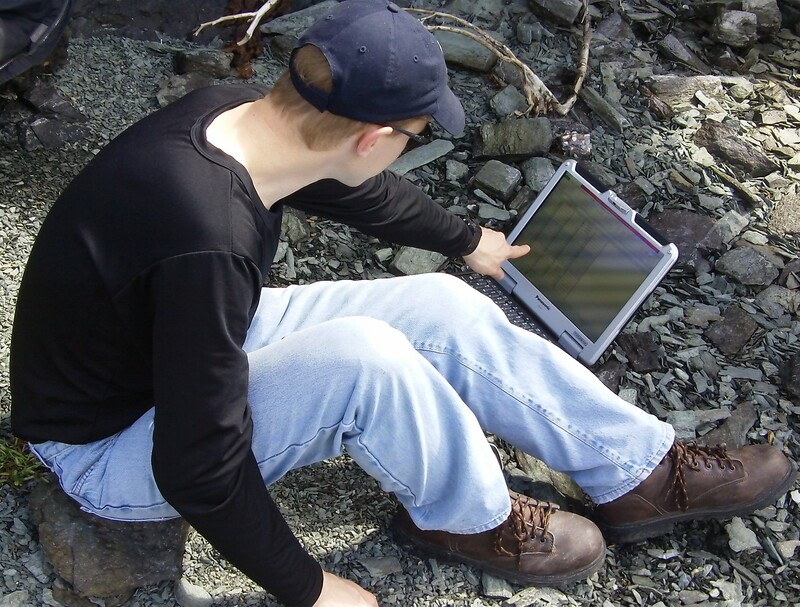 Survey technicians generally need to have a background in the physical sciences or in computer science. 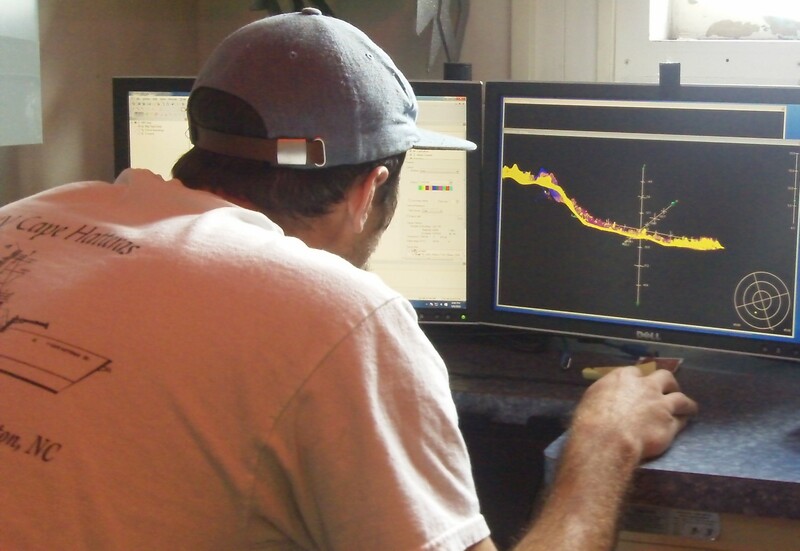 Technology and physical science go hand-in-hand in hydrographic survey work by applying and analyzing scientific data through the lens of advanced technology and software. One needs to be capable in both areas in order to be proficient in the survey department. 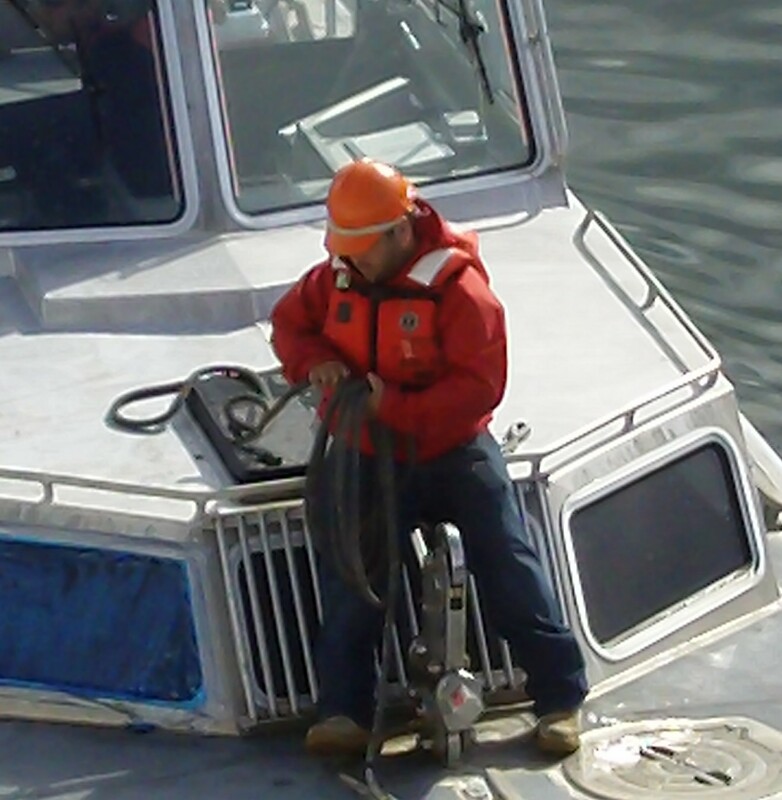 Hydrographic Assistant Survey Technician Steve Eykelhoff collects hydrographic data during a launch. HAST Eykelhoff has a background in geology and hydrology. 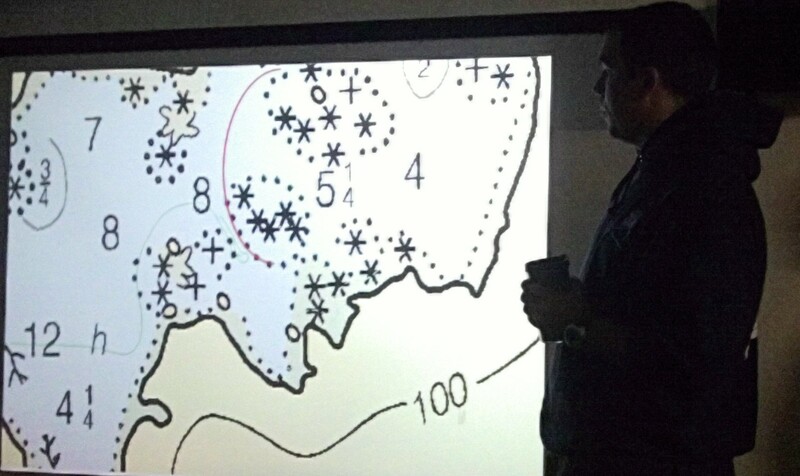 He has worked on many mapping projects including mapping the Erie Canal and the Hudson River. It really comes down to people working together as a team to get something done. In the case of the Fairweather, all of this talent and dedication has been brought together in a team of NOAA Corps, engineers, deck, survey, technicians, and stewards to carry out a remarkable array of scientific work safely and efficiently. This team is always ready for that next big mission because they work together and help each other. Yes, Dillion, my time here on the Fairweather is also drawing to a close. I have enjoyed the three weeks onboard and have learned a lot from a very friendly and informative and driven crew. I thank all of those who were willing to show me what their job in NOAA is like and the underlying concepts that are important to their careers. I learned a great deal concerning NOAA careers and the science that is carried out onboard a NOAA hydrographic ship. Thank you! The NOAA Commissioned Officer Corps is one of seven uniformed services of the United States consisting of more than 300 officers that operate NOAA’s fleet of 16 ships and 9 aircraft. You should already know the answer if you have been following this blog! Refrigeration, boiler, and compressed air are just three of the many systems that are monitored and maintained from engineering. With much of the survey team either on leave or not yet here for the next leg of the hydrographic survey, it can be easy to be lulled into the sense that not much is going on onboard the Fairweather while she is in port, but nothing could be further from the truth. Actually, having the ship docked is an important time for departments to prepare for the next mission or carry out repairs and maintenance that would be more difficult to perform or would cause delays during an active survey mission. On that note while the Fairweather was docked was a perfect time to see the largely unseen and unappreciated: engineering. Engineering is loud and potentially hazardous even when the engines are not running, much less, when we are underway. One of the key purposes of engineering is to monitor systems on the ship to make sure many of the comforts and conveniences that we take for granted seemingly just happen. 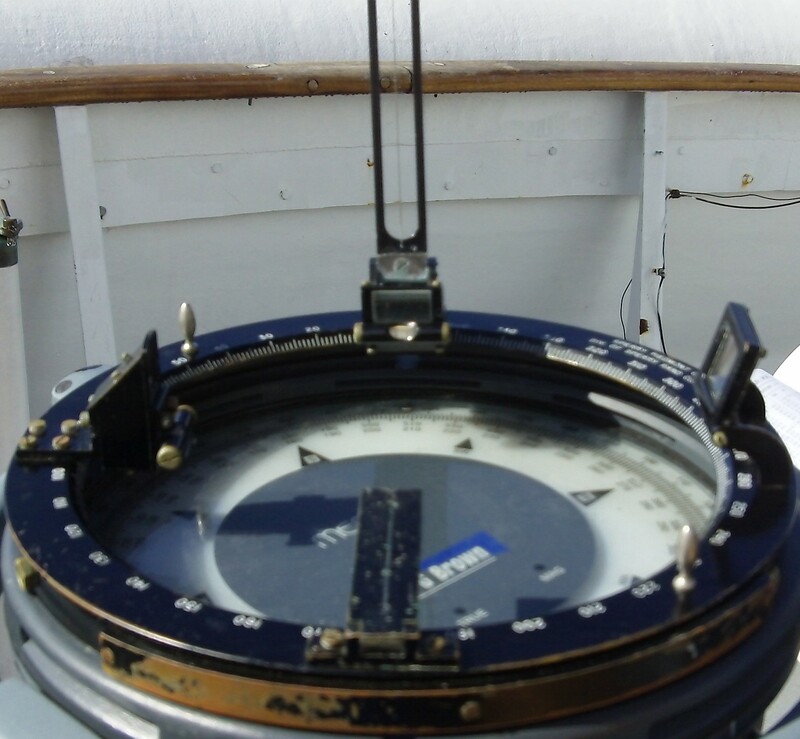 Sensors constantly monitor temperature, pressure, and other pertinent information alerting the crew when a component drifts outside of its normal range or is not functioning properly. Catching an issue before it progresses into something that needs to be repaired is a constant goal. Monitoring in engineering includes a wide array of systems that are vital to ship operations, not just propulsion. Sanitation, heating, refrigeration, ventilation, fuel, and electric power are also monitored and regulated from engineering. Just imagine spending the day without any of these systems while the loss of all of them would send us reeling to earlier seafaring days when humanity was entirely at the mercy of nature’s whim. Tommy Meissner, an oiler in the engineering department, is giving me a tour and overview of engineering. The day after this photo was taken, he took and passed his junior engineer certification exam. Congratulations Tommy! Two diesel generators can produce enough power to power a small town. Water systems pressurize and regulate water temperatures for use throughout the ship while filtration systems clean used water before it is released according to environmental regulations. Meanwhile, enough salt water can be converted to freshwater to meet the needs of the ship and crew. The method of freshwater production ingeniously uses scientific principles from gas laws to our advantage by boiling off freshwater from salt water under reduced air pressures increasing freshwater production while minimizing energy consumption. Steam is generated to heat the water system and provide heat for radiators throughout the ship, and of course the two large diesel engines that are used to provide propulsion for the ship are also located in engineering. Chief Engineer Bill Ness using the ship’s crane to unload a crate of materials and equipment onto the pier. How does one get to work in engineering onboard a ship like the Fairweather? There are several different positions in the ship’s engineering department. An oiler is largely responsible for maintenance, repair, and fabrication and must pass a qualifying test for this designation focusing on boilers, diesel technology, electrical, and some refrigeration. 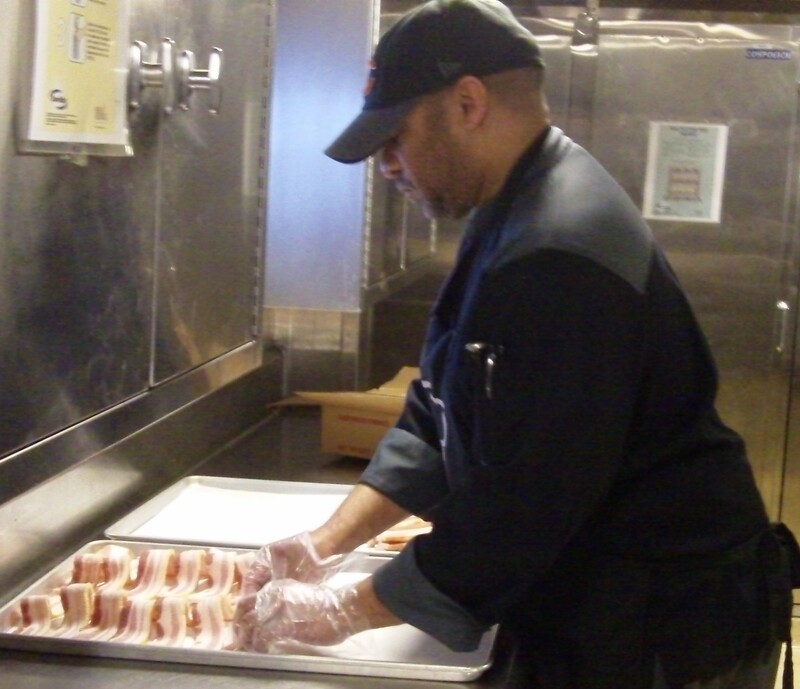 Once the qualifying test is passed, the Coast Guard issues a Merchant Mariner credential. Only then can one apply for that position. Junior engineers must pass a test demonstrating that they have the working knowledge of the systems involved with engineering especially in areas of auxiliary systems and repair. Junior engineers generally need less supervision for various operations than oilers and have a greater scope in responsibility that may also include small boat systems and repair. The scale of responsibility does not stop there, but continues through Third, Second, and First Engineers. Each involving a qualifying test and having more requirements involving education and experience. Finally, the Chief Engineer heads the department. This too requires a qualifying test and certain experience requirements. There are two different ways in which one can progress through these different levels of responsibility. They can attain the formal education or they can document the job-related experience. Usually both play a role in where someone is ultimately positioned determining their role onboard the ship as part of an engineering team. Deck crew Terry Ostermyer (lower, right) with Jason Gosine (middle) and I (left) degreasing cables for the hydraulic boat launching system. It really needs a before and after photo to be appreciated. Credit Randy Scott for the photo. The Fairweather also has a crew that takes care of the ship and its very own fleet of boats. While in port, I worked with our deck department to get a very small sense of what they do on a day-to-day basis to keep the ship running. The pitfall of having a lot of equipment and having the capability of doing many multifaceted missions is that all of this equipment needs to be maintained, cleaned, repaired, and operated. This includes maintaining both the ship’s exterior and interior, deployment and retrieval of boats, buoys, arrays, and various other sampling and sensory systems. When not assisting with carrying out a component of a mission such as launching a boat, the deck crew is often performing some sort of maintenance, standing watch, mooring and anchoring the ship, unloading and loading supplies, and stowing materials. Depending on years of experience and whether they have a Merchant Mariner’s certification or not will determine the level of responsibility. 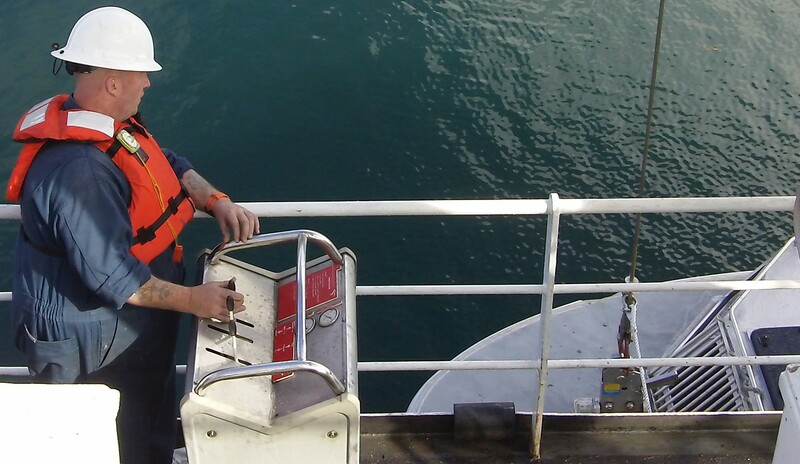 On a survey ship, the deck department specializes in boat launches and maintenance; so, the levels of responsibility reflect that central area of concern. 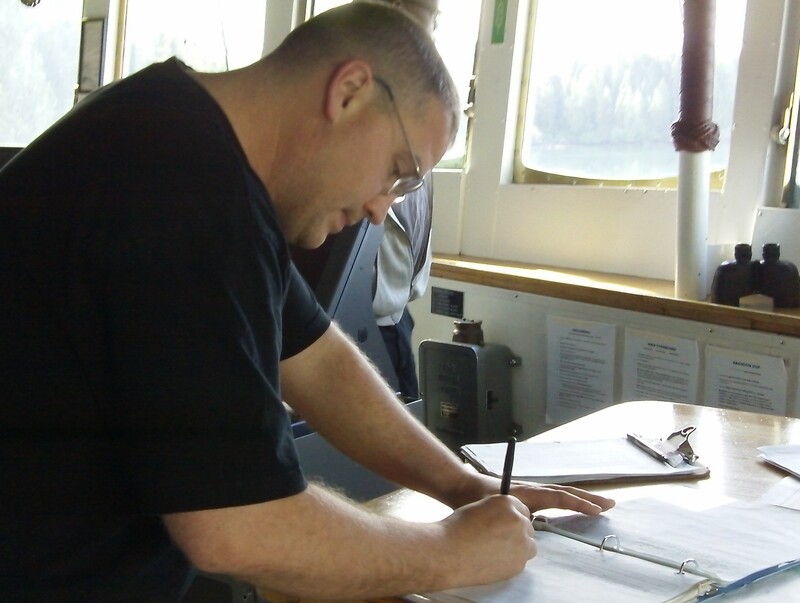 Beginning experience starts with general vessel assistant and ordinary seaman progressing through able seaman with Merchant Mariner’s certification and seaman surveyor or deck utility man to boatswain group leader to chief boatswain. The chief boatswain is in charge of training and supervision regarding all of the areas pertinent to the deck department. This is a stark contrast compared to the deck department on the Pisces that specialized in techniques associated with fish surveys. Cannot paint because of a rain delay? No problem. There is always something else to do like heads and halls. Deck crewmember Denek Salich is in the background. Credit Randy Scott for the photo. When I was with the Fairweather’s deck crew, they were working on taking an old coating of grease off cables and applying a new coating back on. The cables are used to raise and lower the 28’ long hydrographic survey launches. This will be a system that will be in use throughout the next leg; so, now is a great time to clean and replace that grease! After using rags and degreasing agents to strip the old grease off, a new coating was added to the cables. The crew is always conscientious about using chemicals that are friendly to the environment and proper containment strategies to prevent runoff from the deck directly into the ocean. Deck crew need to be very flexible with the weather. Since the weather was not cooperating for painting, we moved indoors and did “heads and halls,” sweeping and mopping hallways and stairs and cleaning bathrooms. The Fairweather resembles an ant colony in its construction; so, heads and halls can be a lot of work even for a whole team of people, but as I am reminded by one of our deck crew, “Teamwork will make the dream work.” It is, indeed, teamwork that makes Fairweather’s missions, not only possible, but successful. The boiler system produces steam that provides a heat source for the water system and the heating system. Yes, the Fairweather needs to be prepared for everything imaginable: spare parts, lines, tanks, survey equipment, safety equipment, tools, and more. Preparedness is key to successful mission completion. Now that I have been on the Fairweather for a few days I have had the opportunity to see much of the ship and learn about how it operates. If ever there were an embodiment of the phrase newer is not always better, it might be the Fairweather. Even though the Fairweather is approaching 50 years old, one cannot help but to attain an appreciation for the quality of her original construction and the ingenuity behind her design. Rooms, compartments, and decks throughout the ship are designed to be watertight and to maximize fire containment. Multiple compartments can be flooded without putting the entire ship in danger. The ship is also designed to withstand sea ice due to its densely ribbed construction and extra think hull. This makes the hull remarkably strong allowing the ship to cut through ice and withstand the additional pressure of ice-covered seas. One of the two massive Detroit electro-motive diesel engines that propel the ship. Credit Tommy Meissner for the photo. The Fairweather is built on redundancy for safety and practicality. If one system gives out, another can be relied upon to at least allow the ship to get back to port or depending on the system continue the mission. There are redundant systems throughout the ship involving everything from communications to essentials for sustaining the crew to navigation. There are even redundant servers in case one set of survey data is compromised or physically damaged the other server may remain untouched. Storage space is a premium on a ship that needs to be self-sufficient for weeks at a time to address foreseeable and unforeseeable events. Every free space has a purpose for storing extra equipment, tools, parts, and materials. Utility and efficiency are running themes throughout the ship. The incoming and outgoing commanding officers read off their orders to signify the official change of command of the ship. The Fairweather also has a captain whose ultimately responsible for the fate of the crew and the ship. While we are in Juneau, the Fairweather is undergoing a change of command. On Wednesday we had a change of command ceremony. 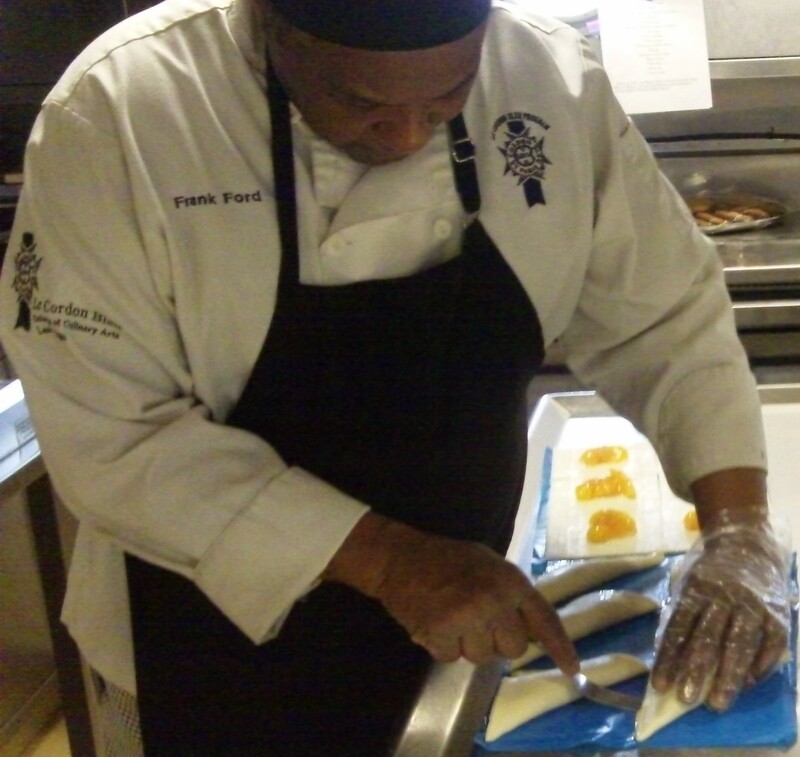 It was a day of celebration and reflection on Fairweather‘s accomplishments. As high-level officials throughout NOAA and other organizations arrived, their arrival was announced or “piped” throughout the entire ship over the intercom system. Later in the day we had the official change over in a special ceremony attended by all of these dignitaries and guests with NOAA Corps officers dressed in full uniform. The Fairweather welcoming dignitaries and guests to the Change of Command ceremony. After everyone read their remarks on the occasion, the time of the official change over was at hand. The Reading of Orders ceremony was carried out where both the outgoing and incoming commanding officers read their orders for their new assignments. Insignia on each officer’s uniform was changed by the spouses officially indicating the new commanding officer and the outgoing commanding officer. With that Lieutenant Commander Mark Van Waes replaced Commander David Zezula as the CO for the Fairweather becoming its 18th commanding officer. As the new CO gave his arriving remarks, he reminded us that “Command of a ship is many things…it is an honor to know that the leadership of this organization places special trust in your skills and abilities to hold this position…command is a privilege; of the hundreds of those who have served aboard the Fairweather, only 18 have been the commanding officer…command is a responsibility…for the ship…to the mission…and to the people.” The Dependents Day Cruise and Change of Command Ceremony made for an eventful week while in port in Juneau. Now we prepare for our first hydrographic mission with our new CO. The Fairweather has a total tonnage of 1,591 tons, displacement of 1,800 tons, a length of 231 feet, and is A1 ice rated meaning it can safely navigate ice covered seas with the assistance of an ice breaker.